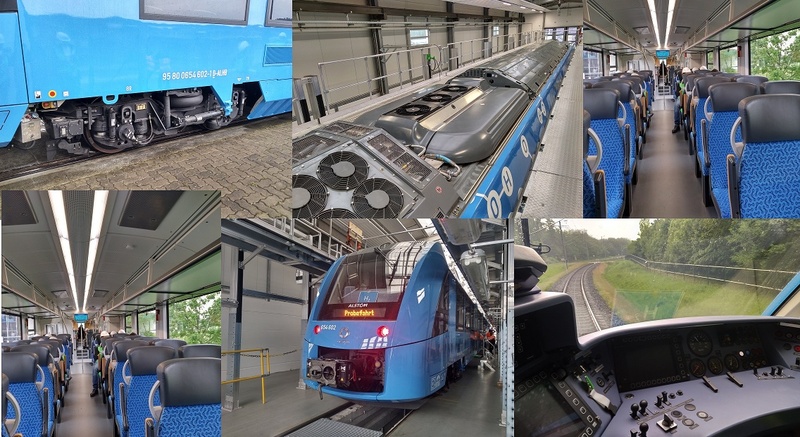 The Oilholic finds himself on the road again; this time roughly 570 miles east of London in Salzgitter, Germany, at a research and testing facility of rail transport solutions provider Alstom. 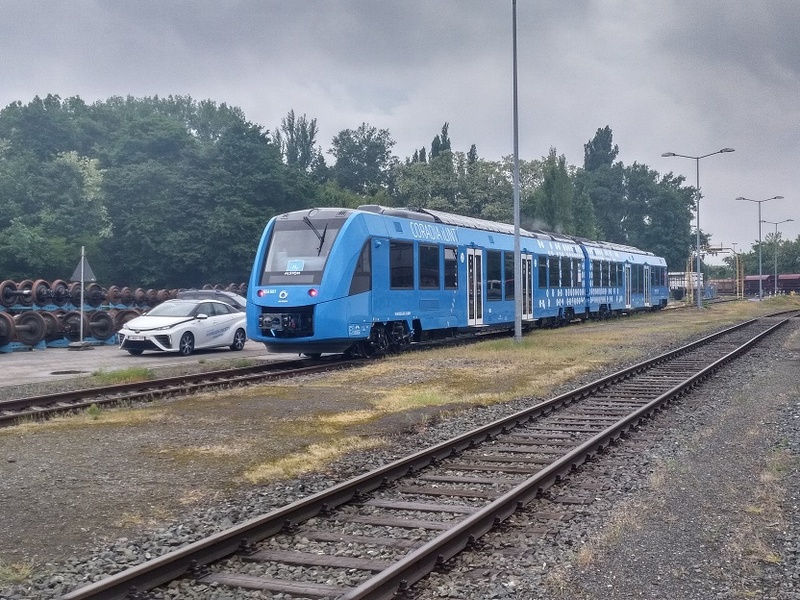 The French company's testing yard is abuzz for a (relatively) new reason – one of it's most popular Coradia series trains, namely the reliable diesel work-horse the Coradia Lint 54, is about to undergo a transformation like none other. Meet the 'Coradia iLint', a full emission-free train that runs on Hydrogen powered fuel cells (see above). It only emits steam and condensed water, and no carbon. To get a perspective, the Oilholic was given a demonstration ride on the train over a one mile track, before its due to enter service on German public transport this year. For all intents and purposes, it was a smooth ride and the quietest ever rail journey this blogger has been on. In fact, were it not for the wheel friction din and movement vibration, you wouldn't hear a thing. You'd imagine reducing pollution, also means minimising noise pollution and the Coradia iLint certainly fits that box. 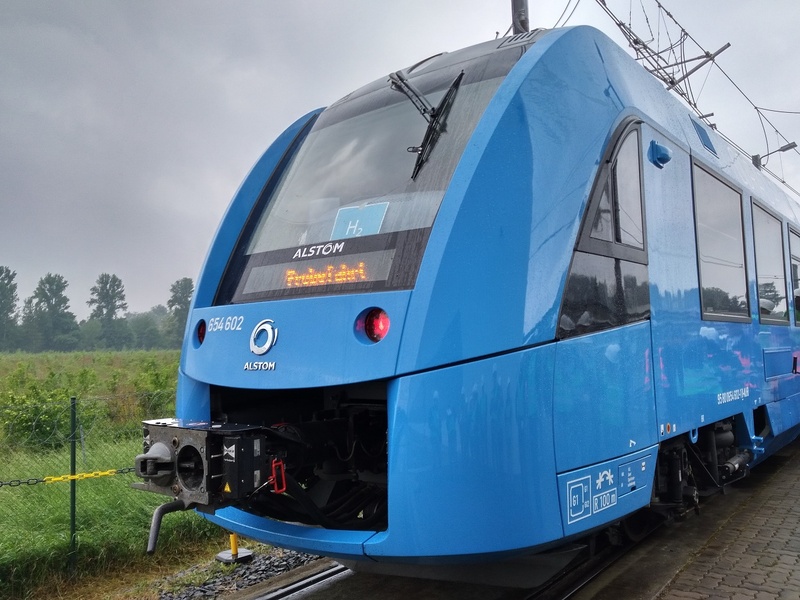 According to Alstom, the prototype is powered by an electrical traction drive. Electrical energy is generated onboard in fuel cells and stored in batteries. The fuel cell provides electrical energy by combining hydrogen stored in the train's tanks onboard with oxygen from the environment, releasing good old H2O. While on the test track the train touched 80 km/h, out in the real world Alstom insists it would match the performance of a Coradia diesel unit, including comparable acceleration, braking and maximum speed (of 140 km/h) with the same travel range and passenger capacity as its hydrocarbon fuelled variant. Two things spring to mind; first being safety and the second being the infrastructure needed to power up the new train. On the first point, an Alstom spokesperson claimed that high pressure hydrogen reservoirs are actually safer than petrol tanks in comparable hazard situations, a point also made by Japanese automaker Toyota, which has been on its own hydrogen powered vehicle pathway since 2015 via its Mirai model. The technology has been rigourously tested, both mobility providers insist. As for the infrastructure needed, Alstom says it is offering the "complete package" consisting of the train itself and its maintenance, and also the whole hydrogen fuelling infrastructure, taking care of all rolling stock and hydrogen related matters, leaving operators to concentrate on their "core competencies." The company's message chimes with that of other proponents of Hydrogen – intelligent energy management coupled with emissions free mobility. And to make the point – a Toyota Mirai pulled up alongside the Coradia iLint (see above), with perfect timing. That's all from Salzgitter, as its time to ride the Mirai around Northern Germany and beyond! Keep reading, keep it 'crude', even if the next few posts are going to about hydrogen! © Gaurav Sharma 2018. Photo 1: Alstom's Coradia iLint. Photo 2: Glimpses of exterior, roof, interior and driver's cabin of the Coradia iLint. Photo 3: Coradia iLint and Toyota's Mirai hydrogen fuelled car © Gaurav Sharma May 2018.